KABUL - Two-thirds of Afghan girls do not attend school due to growing insecurity and poverty, Human Rights Watch said Tuesday, underlining the challenges of educating women in the patriarchal country 16 years after the Taliban were ousted. 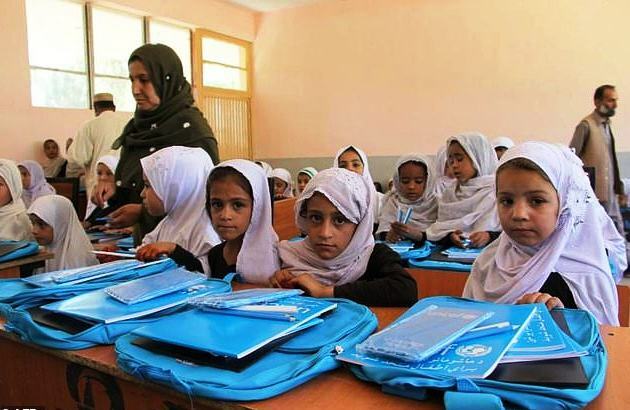 While millions more girls are receiving an education than during the Taliban's repressive 1996-2001 regime, progress has stalled in recent years, the rights group warned, with the proportion of female students falling in parts of the country. About 85 percent of the 3.5 million children out of school are girls, the New York-based organisation said in a report based on research in four provinces and government data. "Sixteen years after the US-led military intervention in Afghanistan ousted the Taliban, an estimated two-thirds of Afghan girls do not attend school," it said. But the rights group warned the real situation was likely much worse because Afghanistan does not record children as being out of school until they have failed for three years to attend class. "Overstated high numbers (for female attendance) have helped give the impression that there is a continued positive trajectory, when in fact numbers are actually decreasing in some parts of the country," the report said. Despite the hundreds of millions of dollars spent in the past 16 years on female education, Human Rights Watch said even the most optimistic statistics showed only "slightly more than half of girls are in school". An education ministry official told Human Rights Watch in April that 39 percent of the 9.3 million students in school were girls but the group noted that Afghan government data was notoriously unreliable. Describing the gains as "partial and fragile", it said millions of girls had never been to school and many more had only attended briefly. "The Afghan government and donors made bold promises in 2001 to get all girls into education, but insecurity, poverty and displacement are now driving many girls out of school," said Liesl Gerntholtz, women's rights director at Human Rights Watch. Government statistics indicate that in some provinces, the percentage of students who are girls is as low as 15 percent, the report said. Among the many barriers to female education are a lack of schools, female teachers and basic facilities such as toilets. On top of that conflict has driven thousands of families from their homes and many school-age girls are forced to work to support loved ones. In areas controlled by the Taliban girls receive limited or no education at all, while in contested zones girls trying to attend class face heightened security threats. "The conflict has been accompanied by lawlessness, as militias and criminal gangs have proliferated, and girls face threats including sexual harassment, kidnapping, and acid attacks, as well as targeted attacks and threats against girls? education," the report said. Two-thirds of Afghan girls do not attend school due to growing insecurity and poverty, Human Rights Watch said Tuesday, underlining the challenges of educating women in the patriarchal country 16 years after the Taliban were ousted.